It may seem like it’s taken us forever to make progress on the rental unit, and that’s because it has. When you only have weekends to work on it things tend to drag out. I’d say the kitchen is done but really not quite: there is a problem with the positioning for the plumbing for the dishwasher that we have to straighten out; we need to purchase and install the cabinet hardware; clean out the refrigerator and stove; install a backsplash and maybe a microwave. We recently installed the kitchen cabinets that we mentioned in our last post and you can read about the details in our recent post for BrickUnderground.com. Longtime New Yorkers Angela Tiffin and Andrew Nichols bought their first brownstone in South Park Slope in May 2012, and have spent two years renovating—first, their own duplex apartment and in recent months, a third-floor rental unit—much of it with their own hands. You can read more about the project at their blog, Brownstone Cyclone. We recently went through the (surprisingly complicated) process ofchoosing kitchen cabinets for our brownstone—both for our owner’s duplex and a rental unit on the top floor. The next step: installing the cabinets, which we decided to tackle ourselves. Although we made a few mistakes along the way, overall it was a pretty easy job, and we regret spending the money on hiring a professional on past kitchen projects. 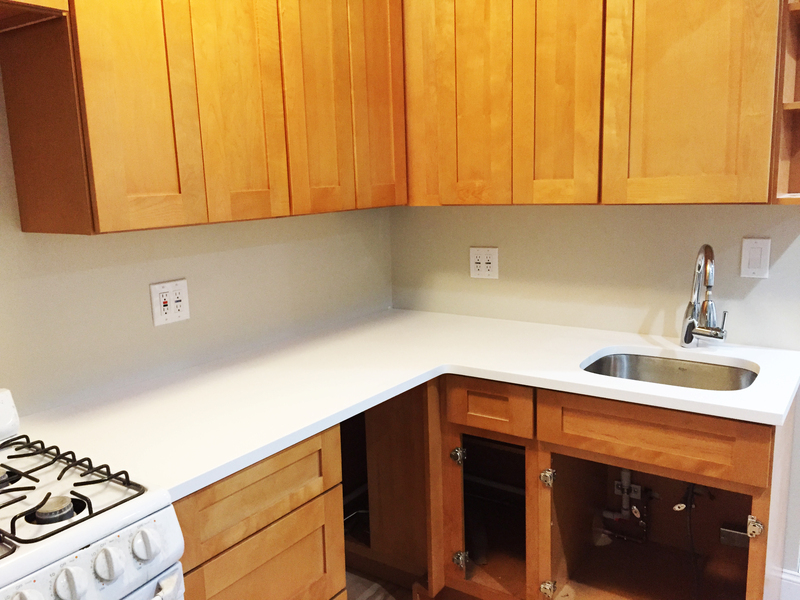 This entry was posted in February 2015, Uncategorized and tagged kitchen, plumbing, rental apartment by Angela. Bookmark the permalink.